Perogies & Gyoza: What a Party! Review copy provided by publisher. All opinions are my own. This is a long weekend in Canada and I am sure that there are parties going on all over the country to celebrate the birthday of our home and native land. Some of these will be on hills waiting for fireworks, others in parks, and a whole lot will be in backyards of homes and cottages. The pot luck is a Canadian tradition that is still going strong. We celebrated Canada Day a little bit early, today, and I was very lucky that our experience was much like the one described in What a Party! Everyone brought something, from music to drinks, and we were lucky to have food from a number of different cultures. We might have been celebrating Canada, but the immigrant experience is part of what Canada is about. It looks like that's what Brazil is about too, according to this book. A child's birthday party starts with an invitation to a friend with a cool sibling, and snowballs from there, so that everyone and their pet ends up bringing a dish from their home country. It's so amazing to see such a diverse cast of kids, parents, and foods all in one book, especially since I recently found out that only around 10% of books published in North America have multicultural content. If there's a problem with this book, it's that there are so many appetizing pictures and no recipes! 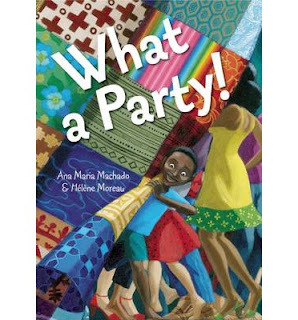 The smiles on the faces of the partiers are infectious, and this book will leave you with a smile on your face as well as a hunger in your belly. This would be a great book for anyone interested in Brazlian culture or to pair with Mama Panya's Pancakes for a primary school discussion on pooling resources in a community.